Space Puzzle: 6 foam mats (each mat consists of 2 puzzle pieces). Space Puzzle is a 12 sided 3D puzzle. 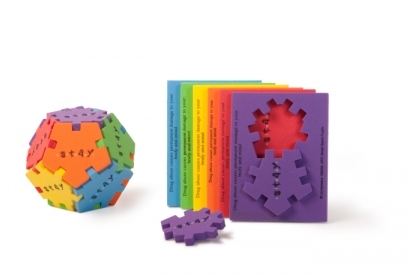 It comes in 6 coloured mats, each with 2 pentagonal puzzle parts. Use all 12 puzzle pieces to make one Space Puzzle. It is possible to make fun interconnections with the Happy Cube.